Think about that one couple you look up to the most. That couple that makes you think, “I want a relationship like that.” What qualities do they have that you admire? These qualities are most likely their bond, loyalty, commitment to each other, and the patience they have for one another. Patience is a crucial component to a happy and healthy relationship and is defined as the ability to tolerate delay, trouble, or suffering without getting upset. There is always going to be something about your partner that irritates you or makes you angry, but practicing patience with them will strengthen your relationship and bond. Without it, love cannot be nourished and the relationship will suffer. Below are a few ways you can begin to practice patience in your current relationships to make them healthier and happier in the long term. Most people don’t make the effort to notice the second they get irritated. What is it that made your mood shift? What is making you upset, uncomfortable, or irritable? Understanding what is happening emotionally with you will help you challenge your thoughts and actions around it. Of course, certain traits or behaviors your partner does will annoy and upset you, but are these smaller things dealbreakers? If not, it is time to notice these triggers and understand how they are making you feel. Once you have identified what makes you tick in your relationship, you can then begin to challenge your thinking and actions around these triggers. Rather than thinking thoughts such as “I hate that my partner leaves their clothes on the floor” or “It bothers me that my partner always overreacts”, consider a different approach. While it is understandable to be bothered by these things, there is a healthier way to think about it. For example, you may think “It bothers me that my partner overreacts, but I know I can handle it.” Rather than reacting with anger or judgment, simply have a conversation with them or help them calm down. As you continue to experience triggers and challenges in your relationship, it is important to have conversations. Having conversations is important in practicing patience as it helps you get to know each other. Talk about the things that are important to you, bother you, make you happy, etc. As you may have different views and expectations, it helps build tolerance, understanding, and compromise in your relationship. As you have conversations, it is important that you not only communicate your needs but hear your partner out as well. What are they telling you? What does this mean to them? Understanding them on this level will aid in you having patience in the future. As you hear them describe ideals different from yours, you are already making the choice to listen rather than judge. Listening is a form of patience and it is worth doing with your partner. Nobody is perfect, and your partner is no exception. Seeing their flaws and accepting them regardless is the definition of what love is. When you accept your partner, you are no longer wishing they were different or trying to change them. 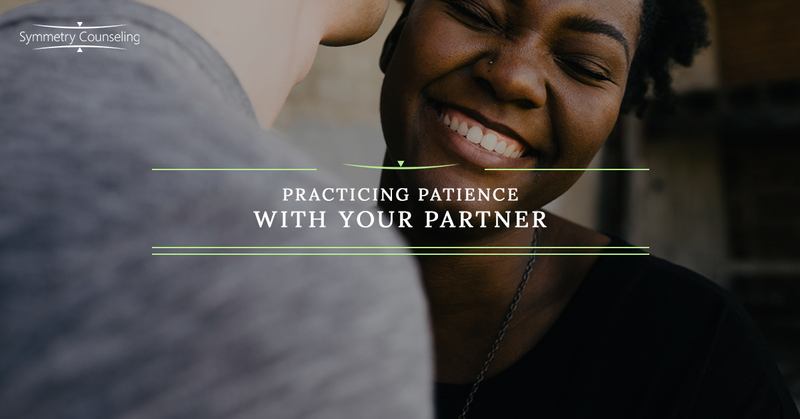 As you bring acceptance into your relationship, you can more easily practice patience with your partner. You already know their limitations, insecurities, and triggers and can be patient with them rather than judge or react to them. Love them whole-heartedly and patience becomes easier. If you are currently struggling to find patience in your relationship, try some of these techniques. If you would like some more guidance, it may be useful to connect with a therapist. Contact Symmetry Counseling at 312-578-9990 to set up an appointment with one of our very skilled therapists today!